Lindsay Jones is not your typical...anything. As a Sound Designer and/or Composer for an average of 40 shows a year, he might be the busiest person in professional theatre. Although he technically lives in Los Angeles with his wife and children, Lindsay also considers Chicago and New York "home" - and has three addresses and local phone numbers to back it up. He started out as an actor and rock musician, can't read or write music, and, despite his insane schedule and impressive career, is one of the nicest people in this business. I first met Lindsay about four years ago when he walked into the Production Office at Chicago Shakespeare Theater (CST), where I'd just started working. Being new and shy, I probably didn't say anything. But I remember what I said to my boss as soon as he left: "So, Lindsay is a guy. Good to know." I didn't know it at the time, but I probably could've said it right in front of him - when I asked him about his name for this article, he told me, "It's still fun to show up places where they think I'm a girl and then scare the crap out of them." The man has a sense of humor. Lindsay pretty much fell into the world of sound design 15 years ago, when a friend asked him to put together music for a Roadworks Production of Suburbia. "I asked what kind of music would they be interested in, and he said, 'Really really loud rock music,' and so, of course, I said yes immediately. The funny part was that I really had no idea what I was doing." Luckily, he'd won a minidisc player in a trivia contest a few weeks before, thanks to knowing who the lead singer of Gumball was (Don Fleming, if you were wondering). "I used that minidisc player for the show (as well as on every other show for the first three years of my career) to make and play back sound cues." After that, he composed his first show - Burn This for Strawdog Theatre. "It was a jazz score that we recorded for $50 in the back office of a restaurant on someone's 4-track recorder." Knowing a little about him before interviewing him, I was surprised to learn that he doesn't read or write music. "I'm completely self-taught. Essentially, I hear up to 18 different instrument lines at a time in my head and then I sing them out, one at a time, to musicians who copy what I sing. Then I put the whole thing together in a computer at the end, and sequence it all out so it works well. It's a little weird, but it works." It might be weird, but clearly he's doing something right. Designing and composing, Lindsay says, "has gone from this other thing that I do to my part-time job to my full-time job to where I am now, which is that I travel constantly around the country doing this. I'm a very fortunate person." When he says, "constantly," he isn't kidding. Right now, he has two shows running in LA, two in New York, one on tour internationally - in Chicago, you can hear his work in Richard III at CST and Yeast Nation at American Theater Company. "Taking a break" is not a phrase he commonly uses. "I'm currently in tech at The Public Theatre in NYC with The Brother Sister Trilogy, which is actually three plays...After that, I'm a musical consultant on Rewind at The Side Project in Chicago, and designing The Lady With All Of The Answers at Milwaukee Repertory." You might think that someone working at such a break-neck pace has some kind of megalomania issue, but that's not the case with Lindsay. "What happens is that you have relationships with people and theatres that you've worked with before, and you want to keep collaborating with them, so you want to take those jobs. And then you have new possibilities of people and places that you haven't worked with before, and you really want to work with them and foster those relationships, so you take those jobs too. Next thing you know, you're doing 40 shows a year. I feel very, very lucky that people continue to think of me and want to work with me. Even though I work on a lot of projects, I always work very, very hard to exceed everyone's expectations (including my own) on every show and push myself to do new and interesting ideas every single time. That's the real challenge and that's also what keeps it so exciting for me. I want people to be wowed by my work on every single show." Keeping things fresh and exciting is a challenge for any designer, but Lindsay's ability to fly by the seat of his pants is probably pretty helpful in this area. The beginning of his work on a show goes something like this: After reading the script, talking to the director and listening to the first read-through, Lindsay creates "'the palette,' which is a large collection of sounds and musical ideas that I might use in the show. Collecting these ideas usually helps me cement musical themes and sonic environments that the show will inhabit." So then, he writes his cues, and comes to tech week ready to push "go," right? Not so much. "The key thing for me, and I know that this may sound a little crazy," he says, "is that I don't really make a lot of the final cues in advance. I wait until I see a designer run-through near the end of the rehearsal process, and then I usually work around the clock for the next few days creating the entire show. The reason why I do it this way is that...I'm not just designing some abstract version of the play. I'm actually designing this very specific version of the play that involves all of the acting and directing choices that have been put into that production. It doesn't exist in a vacuum, and so I need to really integrate my design into that specific production for it to work...I think that this approach comes from my acting training, where I was taught to really be in each moment, listen carefully, and respond honestly to what's been said." So what happens when Lindsay's response to what he sees doesn't mesh with the director's vision? "There are always questions of interpretation, and those require adjustments, based on what's happening onstage...ultimately, it's the director's final decision, and I respect that. All I can do is be the best advocate that I can be for what I have to offer. But it's a fine line, and you have to constantly check and readjust your perspective at every moment throughout the process. Live theatre is all about a collaboration as a group, so you have to take that into account whenever you contribute something." It also doesn't hurt to have a plan B. "On Richard III, I was encouraged by [director] Barbara Gaines to really push the music into this super hard-rock place that is very loud and really aggressive and abrasive, and I swear to you that I kept thinking, 'There is no way that we're gonna [sic] actually do this, once we get to tech.' Like I really just could not believe that we were gonna [sic] put music in this show that could potentially alienate so many people...Five minutes before tech started on that first day, I was having a total panic attack. I was trying to imagine what was gonna [sic] happen, and how I would need to redesign the whole show at the last minute." Braced for his worst fears to come true, with a back-up cue at the ready, he watched and listened as the opening sequence was rehearsed with his original "death metal and doom rock" sound. What happened? "It was awesome! It just worked perfectly. Then Barbara turned to me and said, 'You still want to try that other cue?' and I was like 'No!' From that point on, I was pushing the music as far as it could go into extreme sounds, and it was really fantastic. Some people love the music of the show and some people hate it, but it does work with what's happening." It's a risk that seems to have paid off - Chicago Tribune critic Chris Jones specifically noted the show's "fresh and arresting original rock soundtrack from the great Lindsay Jones" in his review. This level of praise isn't new to Lindsay - his last nine Chicago shows were Jeff recommended. In his career, he's been nominated for 14 Jeffs and won five times, including last week for Route 66 Theatre's The K of D: An Urban Legend. 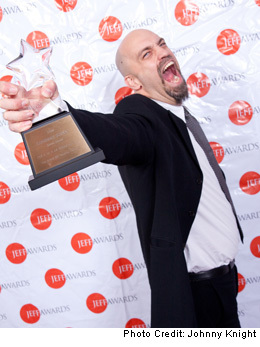 He's received two ASCAP Plus Awards, an Ovation Award, a Los Angeles Drama Critics Circle Award, and was the first (and, so far, only) composer to win the Michael Maggio Emerging Designer Award. Despite his successes and myriad artistic relationships in the Windy City, oddly enough, we may not see him around these parts for awhile. "Other than my music consultation on Rewind at the Side Project, [which runs November 20-December 20], I currently have no shows confirmed in the near future in Chicago...I guess that's just how it goes sometimes." And in case any directors reading this think Lindsay's just too busy, think again. "I've got some time free in the coming year," he says, "so people should feel free to call if they need somebody. Chicago will always be the place that I think of as my artistic home."